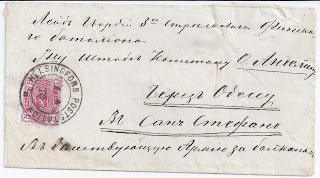 Here is a letter going from Helsinki to San Stefano near Constantinople. 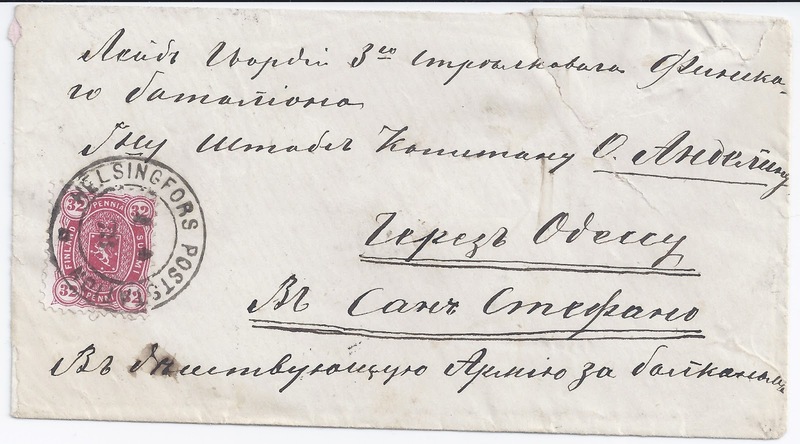 It's an unusual destination but entirely explained by the date: the letter was sent from Helsinki on 4th April 1878 (N.S), transiting through St Petersburg on 23rd / 24th and through Odessa on the 28th (both O.S). There is no arrival cancellation but the letter has been roughly opened suggesting that it was indeed received by its military addressee. On 3rd March 1878, at San Stefano, Russia and the Ottoman Empire signed what was technically a preliminary peace Treaty following on from the Russo - Turkish War of 1877 - 78. The Treaty is remembered principally for its creation of an independent Bulgaria - the price paid for Ottoman defeat. Though a definitive Treaty never replaced the preliminary Treaty, discussions would have no doubt continued at San Stefano - the sender of this letter clearly expected the addressee to be there at least a month later and seems to have been correct in this assumption.